ArmorPoxy offers a wide variety of commercial floor repair products to help get your floor in like-new condition once again. Over time, wear and tear on your commercial flooring will eventually cause a need for repair. Even the highest-quality flooring may give way to cracks, scratches, and other flaws. Both time and regular use take heavy tolls on commercial floors. After extended exposure to corrosive fluids and harsh chemicals, your flooring may need repairing or recoating. As floor begins to break down, it becomes slippery and riddled with imperfections and spalls which can be a safety hazard in working commercial spaces like machine shops, airplane hangars, and factories. Promptly taking care of repairs before further damage can occur, will save you significant time and money. If you don’t have the option of completely tearing up and replacing your flooring, ArmorPoxy offers a wide variety of repair products to help get your floor in like-new condition once again. Do you have small surface imperfects that allow for simple resurfacing of your commercial flooring? Or, are there deep cracks and warping occurring that require a deeper level of repair. Whichever the case, Armorpoxy is equipped to handle all levels of floor repair, from mild to extreme. Our top-of-the-line repair products are effective in plugging leaks, filling in dents and cracks, and restoring the beautiful shine to your commercial flooring. 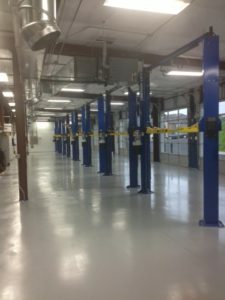 From resurfacing compounds to joint fillers and sealers to non-skid tapes and coatings to interlocking floor tiles, we’ve got you covered when it comes to high-quality commercial floor repair products. We have products that will work on virtually any surface whether it be concrete, asphalt, granite, or tile. Our products can handle commercial spaces of all sizes, from the largest of warehouses to a small auto repair shop. Our knowledgeable staff of trained specialists are ready to assess your commercial floor and equip you with the proper commercial floor repair products to get your flooring back in prime condition. Many of our floor repair products come in our innovative “Job on a Pallet” kit. These kits come with everything you need to perform flooring repairs yourself, no special skills required! Our easy to follow, step by step instructions make installation a breeze, limiting the total time spent on the repair.